Well, the blessings didn't stop with the hog or the Scimitar. 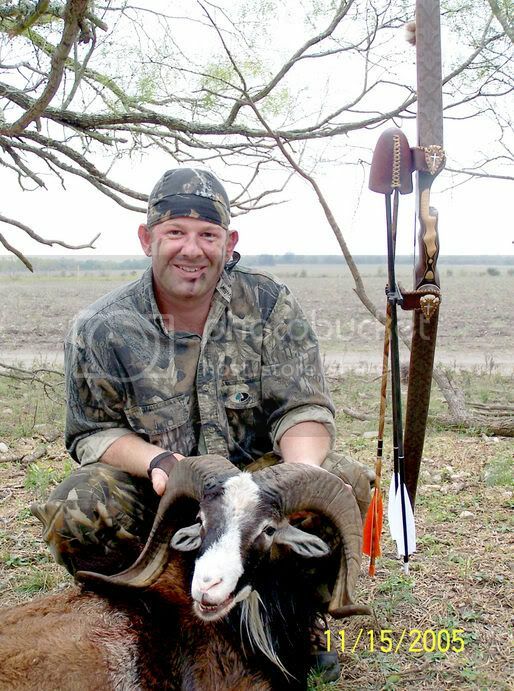 I took this beautiful sheep on the hunt with my father in Hondo Texas on 11-15-05. Using a Morrison 50# TD; Randy's (Sticks and String Archery) compressed POC arrows with a Wensel Woodsman head. Broadside 16 yards. I fell in love with his beautiful coloration and his hide. Stickshooter make those antler knobs? Why of coarse he did!!! Ya can spot his work and Shell's anywhere!! I gave him the description and idea of the limb bolts I wanted, and he as always, came through with perfection.